We rated, reviewed, & compared 15 of the best gaming PC cases across various budgets. These top computer cases are perfect for gamers or anyone else looking for the best tower for their upcoming build. Not only that but for a lot of people, the style of their PC case and the way it looks is also an important aspect. Let’s face it, if you put a Lamborghini engine inside of a Toyota Corolla and priced it the same as the Lamborghini, fewer people would buy it. People like style. So, despite the little direct impact that your gaming computer’s tower will have on your gaming experience, it’s still crucial that you take your time and select one that will give you excellent airflow, upgrade opportunities, and that will look the way you want it to. Because, in the end, your gaming PC’s case is the only part of your computer that could still be relative and usable 5-10 years down the road. In this post, we will take a look at the best gaming cases in 2018 at various price ranges for different budget sizes. I’ve broken down the categories into five different price ranges: gaming cases under $50, gaming cases between $50-$100, gaming cases between $100-$200, gaming cases between $200-$300, and gaming cases over $300. I chose a few different options for each price range and while there are definitely some other worthy gaming cases in these price ranges, I felt these offered the best returns for PC gamers. And, if you’re specifically looking for a mini-ITX case, or a micro-ATX case, check those links for our list of the top options at those form factors. For a quick look at some of the best PC case options across a handful of different categories, the table below shows our picks for the top options for different use cases. We’ve chosen the best overall PC case, the best value option, the top mini-ITX chassis, the best case under $100, and the best cheap case. *For more information on each of these cases, just click the “Read Review »” button to skip to read our overview on that case. You can also keep scrolling to see more case options based on your budget. There aren’t a lot of people who actually have the need for a $300+ computer case. That’s because cases in this price range go far and beyond what a normal tower provides into what are almost unnecessary territories. However, if you’re planning on building a multi-video card, overclocking, liquid-cooled monster, then you may have a need for one of these cool computer cases. And, I suppose if you have an unlimited budget and you just want the best-looking desktop case—one that will stop people in their tracks—then an extreme computer tower will suit your needs as well. They have everything you could want… and then some. Ultimately, you won’t be disappointed in the features in the cases listed below. The Thermaltake Level 20 is a unique case that comes with a huge price tag. Its triple chamber design is impressive, but its ~$900 price tag makes it an infeasible option for 99.9% of people who are looking to build a computer. The Thermaktake Level 20 comes in at a whopping ~$900 price tag on Amazon. Is there anyone out there who would ever consider paying that much for a computer case? There probably aren’t many, but for the select few of you who have the enormous budget necessary to accommodate the Level 20, you will definitely get a unique chassis if you choose the Level 20. The Level 20 sports a triple chamber design, with the front chamber dedicated to holding custom liquid cooling components, the top chamber dedicated to holding the power supply, and the back-bottom chamber dedicated to holding the main components of your system. In terms of clearance, the Level 20 can hold graphics cards as long as 12.2″ and CPU coolers as tall as 7.9″. The video card clearance isn’t very impressive for a case with a ~$900 price tag, but considering that you can find a few RTX 2080 Tis out there under that length, you should still be able to fit as powerful of a system as possible into the Level 20. And, while we listed the CPU cooler height, the reality is that, for this expensive of a case, you will likely be opting for liquid cooling. Fortunately, the Level 20 has plenty of support in that department as well. It can hold up to three different radiators simultaneously, including up to a 480mm radiator in the liquid cooling chamber. Ultimately, though, the Thermaltake Level 20 isn’t a case that will work in 99.9% of system builders’ budgets. For the entire price of this case, you can build a budget-friendly system that will be able to max out pretty much anything you throw at it on a 1080P monitor. So, unless you are working with an unlimited budget, the Thermaltake Level 20 probably isn’t the right option for you. At nearly half the price of the Thermaltake Level 20, the Cooler Master Cosmos 700M still comes with an intimidating price tag. It has everything a system builder could ever want out of a case. But, with a nearly ~$500 price tag, it won’t be a viable option for the majority of builders. While the Cooler Master Cosmos C700M is quite a bit more affordable than the Thermaltake Level 20, it still comes in at a hefty ~$470 price tag. Still, though, that’s nearly half the price of the Level 20 and so, if you’re looking to spend a lot on your upcoming build, the C700M should be a bit more feasible. The C700M is a full tower case that features the traditional Cosmos design on the exterior (with some modifications) and comes with a tempered glass side panel, an aluminum back panel, and a full length PSU shroud. The case also comes with a video card mounting bracket and riser cable so that you can mount your card, rather than install it in the traditional manner in your motherboard’s PCIe slot. For clearance, the Cooler Master Cosmos 700M can hold video cards that are up to 19.3″ long and CPU coolers that are up to 7.8″ tall. Both of those clearances will allow you to install any video card or CPU cooler into this case. However, if you’re going to be spending nearly $500 for a computer case, you’re probably going to want to go with a liquid cooling setup. The C700M has you covered there as well, with support for up to four different radiators at a time, with the ability to house up to a 420mm radiator on both the top and front of the case. The bottom line is that, while the Cooler Master Cosmos 700M is a much more affordable option than the Thermaltake Level 20 listed above, the reality is that at its price (~$470), it also won’t be a very feasible option for the majority of builders. If you can fit it into your budget, though, you won’t be disappointed. These sub-$300 cases are a happy medium between the quality cases that are listed in the sub-$200 category below and the insanity that is offered in the extreme cases listed above. In fact, the cases in this price category border on insane themselves and they can also be used for extreme setups just like the cases listed above. While these cases don’t have quite the overwhelming factor that extreme PC cases have, they are definitely still incredible options, and they’re much more affordable as well. So, if you’re looking for a really high-end computer case for your gaming PC and you don’t want to pay $300+ for one of the monsters listed above, then these cases under $300 will fit your needs. The be quiet! Dark Base Pro 900 offers a very customizable case that will allow you to build an extreme system inside of. It’s also designed to help you reduce the noise levels of your system to ensure quiet operation. Ultimately, at over $250, it is one of the more expensive options on this list. However, if you have a larger budget, the Pro 900 is an option that you’ll at least want to consider. If you have a larger budget to work with for your next PC case but you’re still concerned with getting a good return on the amount you’re going to spend, you might want to consider be quiet!’s Dark Base Pro 900 (rev. 2) full tower case. The Dark Base Pro 900 does come in at a whopping ~$260, but considering the cost of the Corsair 1000D and the Caselabs MAGNUM, that seems like a steal considering what the Pro 900 offers. With the Dark Base Pro 900 you get a large-form-factor case that has clearance to hold graphics cards up to 18.6″ in length and CPU coolers up to 7.3″ tall; both of which will provide you with enough clearance to hold any graphics card and any air CPU cooler currently on the market. The Pro 900 can also accommodate up to 420mm long radiators and you can hold up to four different radiators inside of the case simultaneously. And, as it is a be quiet! case, the noise level on the Dark Base Pro 900 is exceptional. So, if you’re looking for a high-end case that will give you plenty of options to build a high-end system and that will also help cut down on the noise levels of your PC, the Pro 900 is worth a look. For those that like the style of the Corsair 1000D, but that don’t like the price tag that it comes with, the Corsair 500D offers a similarly designed case for a fraction of the cost. And, while this RGB version of the 500D comes in at over $200, you can save even more by going with the non-RGB version, too. If you like the Corsair Obsidian 1000D but you just can’t justify spending $500 on a case, or you don’t need that big of a chassis, the Corsair 500D is a similar looking (and similarly-designed) alternative. The 500D comes with dual tempered glass side panels and it can hold graphics cards that are as long as 14.6″ and CPU coolers that are as tall as 6.7″. So, with the 500D, you’ll have plenty of clearance to build a powerful system inside of. This version of the 500D also comes with three RGB lights installed on the front panel. However, the non-RGB version of the case comes in at a quite a bit lower of a price and so if you don’t need the RGB lights (or you want to install your own), that would probably be the better route to go. Overall, the 500D is a nice alternative for anyone who likes the look and the layout of the 1000D, but who doesn’t have the budget (or the need for the extra size) that the 1000D comes with. Thermaltake’s Core P5 is a unique open frame case that is perfect for anyone who wants their system to stand out. It’s designed to accommodate enthusiasts who are looking to install a custom-loop liquid cooling system, but it can be used with AIOs and heatsinks as well. Ultimately, the tempered glass open frame design set this case apart in terms of aesthetics and, as such, should appeal to certain builders. Thermaltake has introduced a couple of really cool open frame cases that offer a nice unique option for anyone who wants their PC to stand out from the crowd. Thermaltake’s Core P5 is an open frame ATX tower case that is built for those who want to show off the “core” of their system. And, more specifically, for users who want to do a custom-loop water cooling setup. The P5 has room for graphics cards as long as 11″ when a reservoir is installed, and well over 20″ if no reservoir is installed. However, as I mentioned above, as this case is built for users who will build a custom-loop, you’ll likely use a reservoir in this case and, therefore, you are limited to an 11″ graphics card. The front panel, two side panels, and the top and bottom panels on this case are all tempered glass. In the end, if you’re looking for one of the best computer cases under $300 and you want something that will help you stand out from the crowd, the Core P5 might be a case you’ll want to consider. The sub-$200 cases listed below aren’t that far behind the $200-$300 cases listed above. In fact, for these tier 3 options, you can get a high-quality case that will house even the most extreme setups. The computer tower cases listed below are ideal for mid-to-large sized budgets and will give you plenty of options to choose between. Ultimately, though, if you’re willing to spend over $100 on a case, you can expect good quality. And, since choosing a PC tower is largely based off of personal preference, if you prefer the style of a case in this price range over the style in a case listed above, then, by all means, jump on it. Because, in the end, even these computer cases will offer the necessary features to suit the majority of builders’ needs. With a ton of space, good airflow, a tempered glass side panel, and an extremely fair price tag, the Thermaltake Core X71 is our pick for the best value case currently available. If you’re looking to build a high-end system but you don’t want to drop ~$300 or more on an extreme case, the X71 will give you similar build potential for a fraction of the cost. In our opinion, the Thermaltake Core X71 is one of the best value options currently on the market. As it is a full tower case it obviously isn’t a great option for anyone who wants to build a small-form-factor PC. However, for those of you who prefer bigger and badder cases, the X71 is large enough to suit your needs. And, the best part is that it won’t cost you hundreds of dollars to get. In fact, the Core X71 comes in at just under ~$130. For that ~$130 you’ll get a large-form-factor case that can hold graphics cards up to 16.5″ long and air CPU coolers up to 7.1″ tall. The Core X71 can also house an extra-large 480mm radiator on the front panel as well as hold up to six different radiators simultaneously. So, if you’re looking to build an extreme liquid cooling setup, this case will allow you to do so. The case also comes with a dual-chamber design with the motherboard chamber up top on the power supply chamber located at the bottom of the case. The bottom chamber also comes with support for three 120mm fans to help keep your power supply as cool as possible. And, the case can hold up to 15 fans in total. Ultimately, for the price you pay and the features, size, and value you get out of the Core X71, it should be at the top of the list for any system-builder who wants a larger case but who doesn’t have an insane budget to spend on one. The Phanteks Evolv X is another worthy case option for anyone who has a larger budget. It has more than enough room to house an extreme system with liquid cooling and it can even be upgraded to hold dual systems (E-ATX and mini-ITX). Another solid option in the sub-$200 price range is the Phanteks Enthoo Evolv X. The Evolv X comes in at just under $200 and offers a high-end chassis that can hold just about any setup possible. The case can support video cards up to 17.2″ long and CPU coolers up to 7.4″ tall. The Evolv X can also hold three different radiators simultaneously, including a radiator up to 420mm long on the front panel. So, whether you want to go with a large air cooler, a 360mm AIO cooler, or run your own custom liquid cooling loop with a 420mm radiator, you can do so in the Evolv X. The Evolv X is also a tempered glass PC case and it has built-in RGB strips on the full length PSU shroud and on the front panel. Perhaps the most unique feature of the Enthoo Evolv X, though, is that fact that it can be upgraded to hold dual systems. With the dual system upgrade, the Enthoo Evolv X can hold both an extended-ATX motherboard and a mini-ITX motherboard. Overall, the Evolv X is an excellent case option if you’re looking to build an extreme gaming computer. Encased by tempered glass panels and featuring fans equipped with RGB lights, the Crystal Series 570X from Corsair is a visually captivating mid-tower case. It comes with three fans installed and has room for up to six. It’s compatible with virtually any radiator size and can fit a graphics card that’s up to 14.5 inches long, too. If you love RGB lights and tempered glass, then you ’ll want to consider the Corsair Crystal Series 570X. 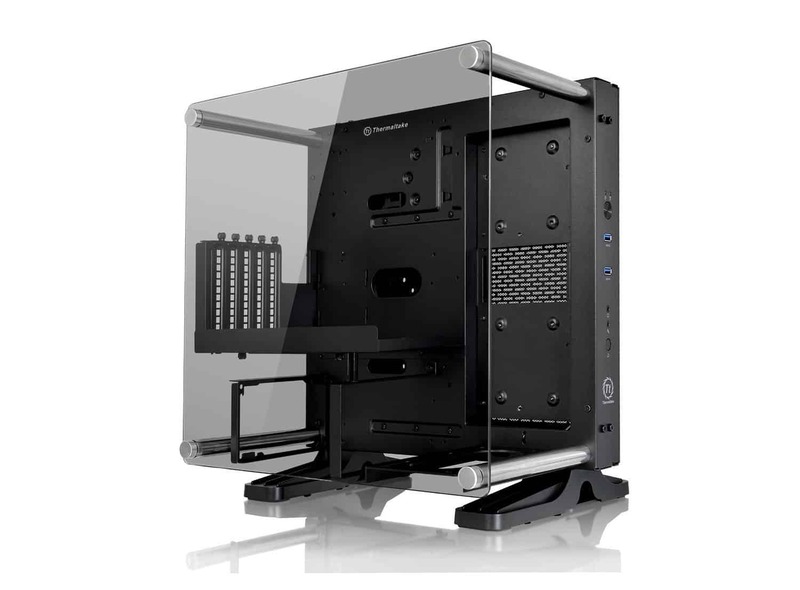 This mid-tower design is encased with four tempered glass panels, giving you full visibility of the front, top, and sides of the case. It comes with three SP 120 RGB LED fans and has the capacity to run up to six fans total. This model has a built-in RGB controller which allows you to select your LED effects to light up your build. If you want to add more, it’s compatible with 360mm, 280mm, 240mm, and 120mm radiators. You’ll just need to add fan trays to customize your space. The controller also keeps your components running cool to maximize the performance of your system. To keep the case aesthetically pleasing, it has built-in cable routing channels and comes with velcro cable straps so that you have streamlined internal cable management. The front panel features a high-speed USB 3.0 port for easy access and has a bright white LED backlit CORSAIR logo. If you’re not for branding, this panel is removable. While it looks good, the 570x is a straightforward case. It has a tool-less design, and it has three-point dust filter access which makes it easy to clean and maintain. Overall, if you’re looking for a high-end tempered glass PC case for under $200, the Corsair 570X is one option you’ll want to check out. The NZXT H200i is our choice for the top mini-ITX case currently on the market. It can house standard-size graphics cards and air CPU coolers and it also has support for 120mm AIOs/radiators, too. And, its PSU shroud, tempered glass, and RGB controls help it stand out among other mini-ITX options out there. If you’re looking for a high-end stylish mini-ITX case, you might not want to look further than the NZXT H200i. The H200i takes the latest trends in computer cases (namely, PSU shrouds, tempered glass, and RGB lighting control) and combines them into a compact chassis. However, the H200i isn’t so small as to limit you to the kind of performance you can get if you were to build inside of it. It can hold graphics cards up to 12.8″ long and air CPU coolers up to 6.5″ in height. While the graphics card clearance is low compared to the other options on this list, the reality is that there are GTX 1080 Tis out there that come in shorter than 12.8″ long. So, unlike other mini-ITX cases where you’re forced to use a low-profile graphics card, in the H200i you can easily fit a full-length graphics card inside of it. Ultimately, if you’re looking for a feature-rich case that will work with a mini-ITX motherboard and that won’t limit you on the kind of performance you can get from your system, the H200i is a solid choice if you have the budget to accommodate it. For the sub-$100 cases, I looked at options that cost between ~$50-$100. And, surprisingly, the cases in this tier are pretty darn good options. For instance, the Phanteks Pro M and NZXT H500i offer high-quality mid-tower cases for under $100. And, for the price it comes in at, the Phanteks Eclipse P350X is, in my opinion, one of the best value options currently on the market. Most of these cases can hold just about any setup you have in mind with exception to something on the very extreme side. But, multi-video card setups and liquid cooling are definitely possible with these cases, which is pretty cool considering their price. Ultimately, if you don’t have more than $100 to spend on your case but you don’t want to sacrifice quality on the cheap computer cases below, these cool PC cases offer a nice middle ground. The Phanteks Pro M is a nice all-around case that will give you plenty of room to build a high-end system and will also allow you to explore custom liquid cooling, too. Ultimately, it’s a stylish case that offers excellent price-to-performance and it is worth considering if you have a moderate (or larger) budget. Our pick for the best computer case under $100 is the Phanteks Pro M mid-tower case. The Pro M sneaks in just under $100 and it comes with a tempered glass side panel, a PSU shroud, and it can support up to seven different fans along the front, top, and rear of the case. The Pro M can hold the longest graphics cards and CPU coolers on the market (up to 16.5″ long and 7.6″ tall respectively) and so you’re really not limited on what you can do inside of this case in regards to sheer performance. The Pro M also has plenty of options for liquid cooling, too, with support for up to 360mm radiators and the inclusion of reservoir mounts. So, if you’re looking for a fairly affordable PC case that will allow you to build a high-end system inside of, the Pro M is probably an option you’ll want to check out before you make your decision. Another option you have at just under ~$100 is the NZXT H500i. Like the Phanteks Pro M, the H500i is also a mid-tower case that has a PSU shroud, a tempered glass side panel, and enough clearance to house a high-end build. So, really, between those two options, it will come down to your personal preferences on aesthetics to determine which choice is better for you. 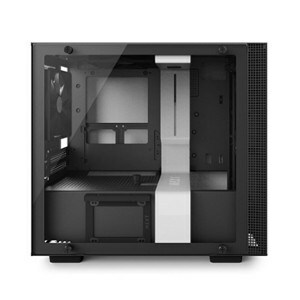 Another solid option from NZXT is their H500i mid-tower case. Like the H200i, the H500i has a PSU shroud, a tempered glass side panel, and advanced support for RGB lighting (out-of-the-box). The H500i can hold graphics cards that are up to 15.0″ long and CPU coolers as tall as 6.5″. The case also comes in four different color schemes: white and black, black, black and red, and black and blue. So, if you’re looking to do a specific color scheme for your build and one of the H500i’s color schemes matches your own, that is an extra plus. Overall, the H500i stacks up well with the Phanteks Pro M. So, if you have right around ~$100 to spend on a case, I’d say that of those two choices, go with whichever one has a style that is more appealing to you. For just a little under $70, the Phanteks P350X is easily one of the better value options on the market. In fact, while we chose the Core X71 as our top value pick, the P350X can definitely make a case as well—especially for those of you who have a tighter budget. Ultimately, if you’re looking for a nice-looking case (our opinion) that will allow you to build a powerful system inside of and you don’t have a ton of money to spend, the P350X will be an excellent option for you. If you don’t have a ton of money to spend but you want to get a nice-looking case that will give you enough room to build a powerful gaming computer inside of, for just ~$70 you can land the Phanteks Eclipse P350X. The P350X can hold graphics cards that are as long as 15.7″ and CPU coolers that are as tall as 6.3″. The case can also support 280mm radiators and hold extended-ATX motherboards as well. So, there really is no limit on what you can put inside of this case. With the P350X, you also get a PSU shroud, a tempered glass side panel, and some built-in RGB strips as well. So, ultimately, for a really fair price, you get a lot of high-end features as well as what I think is a nice-looking design, too. Typically, in most tiered lists, the tier at the bottom represents a poor offering. This isn’t so for these tier 5 cases. While these cases won’t blow anyone away, they will allow you to build a solid system inside of them without forcing you to spend a ton of money. In fact, even if you’re looking to build a high-end single-GPU (and even a dual-GPU) setup, there are some cheap PC cases in this tier that will work for you. So, don’t be dismayed if your budget only allows for a sub-$50 case. They are plenty good enough to get the job done. And, if you’re building a budget gaming PC, these cheap computer towers will not only give you an affordable option to house your components, but you can also rest assured that the cases listed here will fit even the most powerful graphics cards out there as well. If you’re looking for what is, in our opinion, the best computer case under $50, look no further than the Fractal Design Focus. 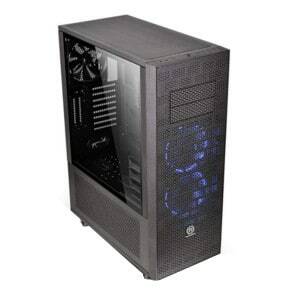 It’s an affordable mid-tower case that offers excellent airflow for the price you pay and will give you enough space to build a high-end computer inside of. Our pick for the top case under $50 is Fractal Design’s Focus. The Focus is a mid-tower case that comes available in five different color schemes and offers good airflow and plenty of space to hold a higher-end system. It can accommodate graphics cards up to 15.0″ long and CPU coolers up to 6.5″ tall. It can also hold radiators up to 280mm in length on the front panel, or up to 240mm in length on the top panel. So, liquid cooling isn’t out of the question in this case as well. Overall, there’s nothing fancy with the Focus. It’s just a solid budget-friendly computer case that looks nice and gives you the space you need to build a solid computer inside of. If you want to build a budget-friendly mini-ITX gaming PC, the sub-$50 Thermal Core V1 has enough clearance inside of it to house standard-size graphics cards and CPU coolers. So, while it does have a small footprint, don’t let that fool you into thinking that it won’t work for a powerful budget PC build. The Thermaltake Core V1 is not only one of our favorite options for a budget-friendly mini-ITX case, but it also made our top choices for the Best Cube-Style Cases, too. Its compact cube-style design gives builders a unique option for building a smaller form-factor system. And, because it comes in at under $50, it won’t break the bank either. Despite its small size, the Core V1 can still hold graphics cards up to 11.2″ long and CPU coolers as tall as 5.5″. So, you can either use standard size coolers and graphics cards in this build, or you can opt for a low-profile CPU cooler and low-profile graphics card to give you more room, too. In the end, though, if you’re looking for a cube-style mini-ITX case and you don’t have a huge budget, the Thermaltake Core V1 should suit your needs just fine. If you’re strapped for cash and you need to optimize every cent of your budget to allow you to get as good of a processor/graphics card combo as possible, then opting for the $30 Thermaltake Versa H15 will help you save money to put towards those more important components. Finally, we have the Thermaltake Versa H15 micro-ATX case. While the Fractal Design Focus and the Thermaltake Core V1 are excellent budget options, we chose the Thermaltake Versa H15 as our top budget pick mainly because of the insanely low price it comes in at. You can land the Versa H15 For just $30 ( which is ~$20 less than the Core V1 and the Focus). And, for that $30, you get a case that can hold just about any graphics card and CPU cooler currently available. Yes, the micro-ATX motherboard form-factor will limit you a bit on the kind of system you can put inside of this case. However, for the price you pay and the potential you can get out of it, the Versa H15 is a good cheap option that will allow you to build an entry-level system inside of now and that will also give you the opportunity to upgrade to a more powerful system in the future, too. So, if you’re working with a tight budget and you want to optimize it so that you can build as powerful of a system as possible, you can save some money by choosing the Thermaltake Versa H15. Which Case is Right for Your Gaming PC? The case you choose for your gaming PC is not going to increase your framerate or improve your load times. It’s also not going to increase how much storage space you have or how much memory your PC contains. However, the case does hold all of your components and, as such, dictates which components you can use. If you choose a case that doesn’t have a lot of clearance for your graphics card, you will be limited to choosing a smaller graphics card. And, while a lot of graphics cards manufacturers are packing their higher-end cards into smaller offerings, in most cases, the smaller the card, the less power it provides. Another key component of your case is air flow. The better the design of the case is, the more airflow can enter into it and keep your components cool. And, of course, one of the most important parts of choosing your case is aesthetics. While some people don’t care what their case looks like, for others, the design is the most important aspect. So, when looking for the best computer towers, it’s important that you take those three factors into consideration. Fortunately, though, the options listed above will give you plenty of choices to choose between, from cheap computer cases all the way up to the best computer cases. No mention of the Lian Li O11 Dynamic? You forgot phanteks evolve x,not only can it fit 10 hdd and 9 ssd it supports dual systems! These are the best pc cases of 2018. Which one of these cases is the best choice?